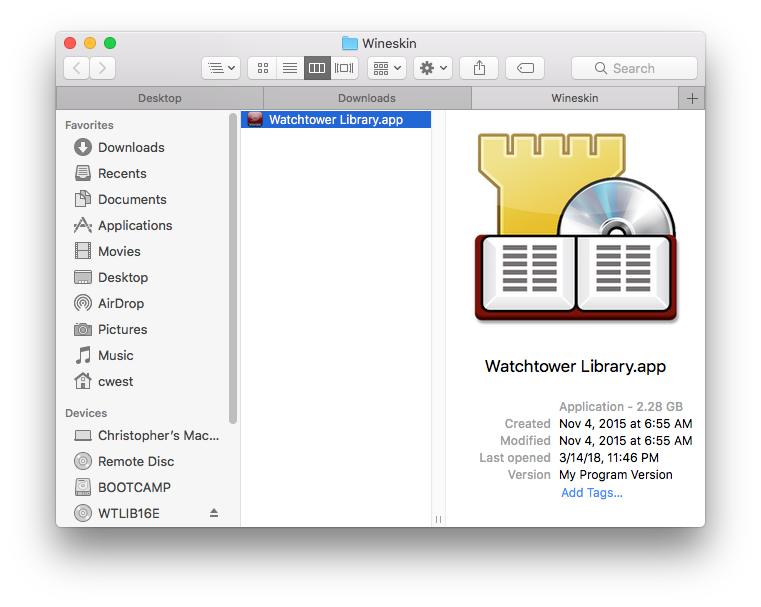 Either insert the Watchtower Library disc or if you have the Watchtower Library setup files in a folder make sure you can find it. 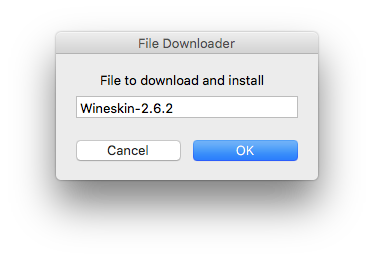 Unzip Wineskin Winery if the downloaded file from the previous step is a ZIP file. 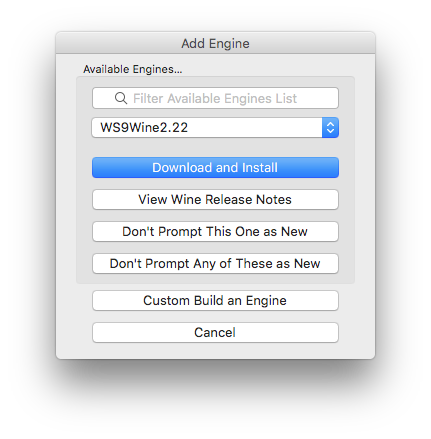 Open the Wineskin Winery application. Click the + button to install an engine. 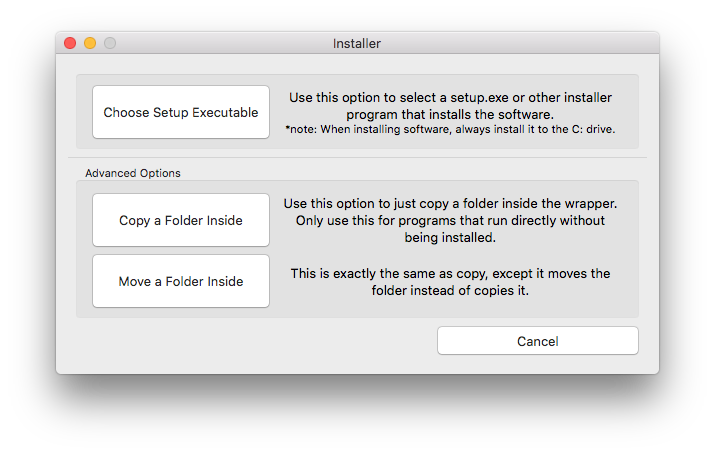 Make sure the latest engine (that doesn’t have the word staging in it) is selected in the dropdown and then click “Download and Install”. Click “OK” to download and install the selected engine. 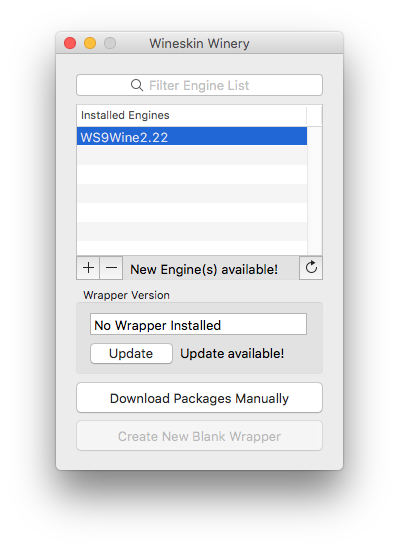 After the engine has been downloaded and installed, make sure you have an up-to-date wrapper version or if not click the “Update” button. Click “OK” to download the updated wrapper. Click on “Create New Blank Wrapper”. Enter the name that you want the application to be (eg. Watchtower Library). After entering the name click “OK”. Wait for your wrapper to be created. Click “View wrapper in Finder” once the wrapper creation finishes. 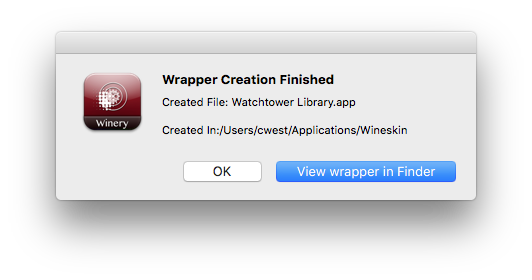 Try opening the new wrapper application that you created. NOTE: If it doesn’t open the first time try once more. Click on “Set Screen Options”. 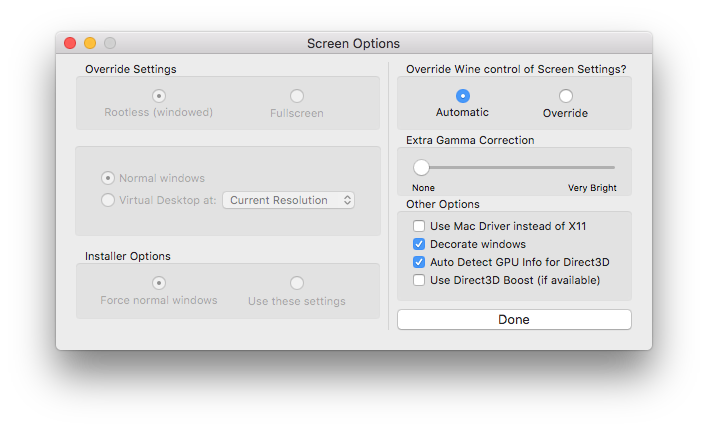 Uncheck the checkbox for “Auto Detect GPU Info for Direct3D” and then click “Done”. Download and unzip this icns file (icon file). In the “Configuration” tab click the “Browse” button under where it says “icon” and select the icon file we downloaded previously. In the dialog box find the “WTLSetup.exe” file and then click “Choose”. 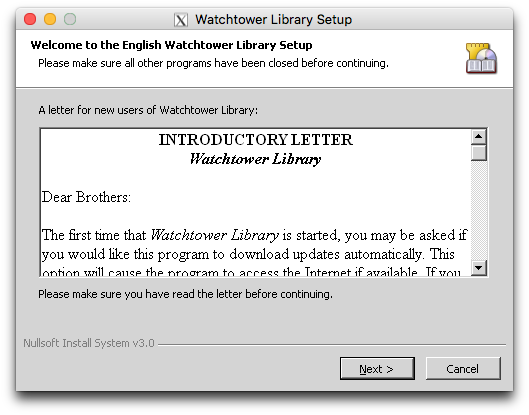 Follow the instructions to install Watchtower Library. 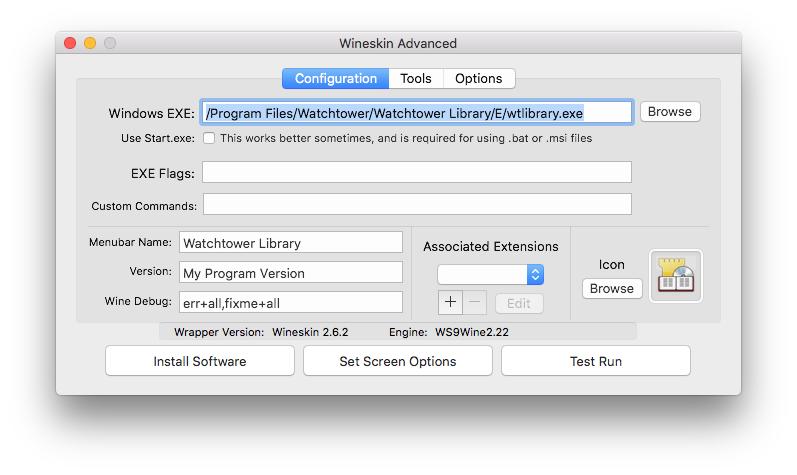 NOTE: Do not change the path of where you are installing Watchtower Library. The default location should be fine. Once the setup is finished, looking ath dropdown of the executable files, select the one which ends in “wtlibrary.exe” and then click “OK”. 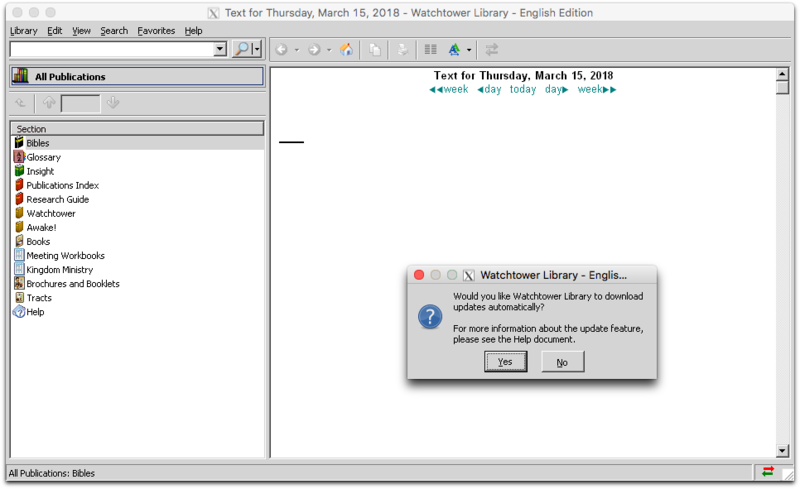 NOTE: Trying to update Watchtower Library the first time may not work. You may need to close and reopen the application and then go to “Help” > “Check For Updates” to make this work. After closing the test run you will be asked if you want to see the logs. Click “Cancel”. 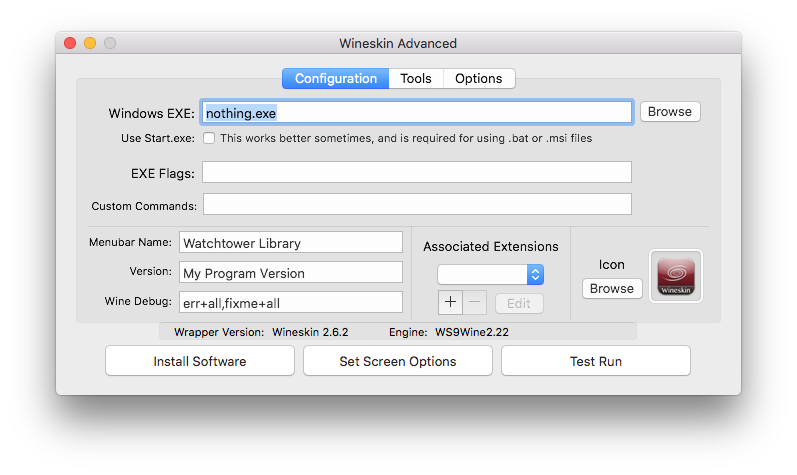 Close the “Wineskin Advanced” window and reopen your Watchtower Library application wrapper. We just want to let you know that your efforts are really appreciated. Thank you for making this a breeze! Just wanted to also thank you for teaching us how to fish. Now I think I can install any version of WTLibrary and possibly other basic windows applications. I am not too sure how to fix it. I run F-Secure XFENCE on my Mac and suspect that it’s blocking a creation of a essential file for WT Lib to run? I have had a look at XFENCE’s configuration and tried disabling a few settings but no luck. Sorry, it seems like it is due to some other software that may use Wine or other dependencies. 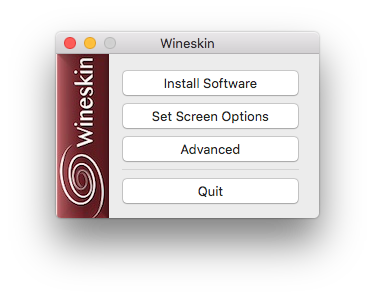 I’m by no means a pro at using Wineskin so I’m sorry but I cant help you right now. Hola Chris. 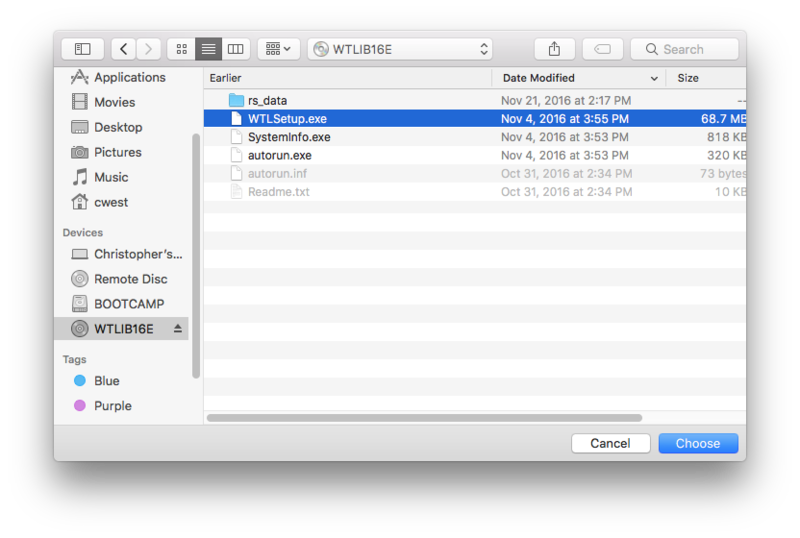 Muy útil me ha sido la instalación de WTLibrary en mi MAC. Sin embargo, tengo el problema que cuando quiero copiar contenido del WTLibrary y pegarlo al Word, no puedo. Pregunta, ¿Cómo puedo hacer para que me deje copiar contenido y pegarlo en Word? Perdon que no te respondi antes pero te mande un mensaje a tu correo. Espero poder ayudarte. Sin embargo, tengo el problema que cuando quiero copiar contenido del WTLibrary y pegarlo al Word, no puedo.Pregunta, ¿Cómo puedo hacer para que me deje copiar contenido y pegarlo en Word? Introducir una palabra en el documento y cortar esta palabra del documento. NOTA: Este paso es clave. Ve a WTLibrary y pon tu cursor en el campo de buscar. Presionar CTRL y V a la vez para pegar la palabra que copiaste. 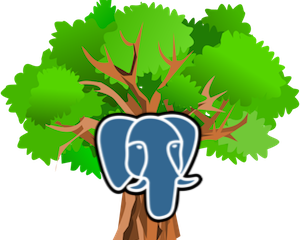 Intenta copiar algo de WTLibrary ahora y el proceso debe funcionar. Me parece que este proceso funciona porque por alguna razon la aplicacion de Wineskin no puede iniciar el proceso de copiar pero puede usarlo despues de que una aplicacion Mac lo inicie. Perhaps you could add at the end that you need to move the wrapper in the folder called applications. Thank you sooooo very much for spelling this all out for me! I am a Mac newbie at age 47. So much to learn for this PC girl! You made it very smooth. 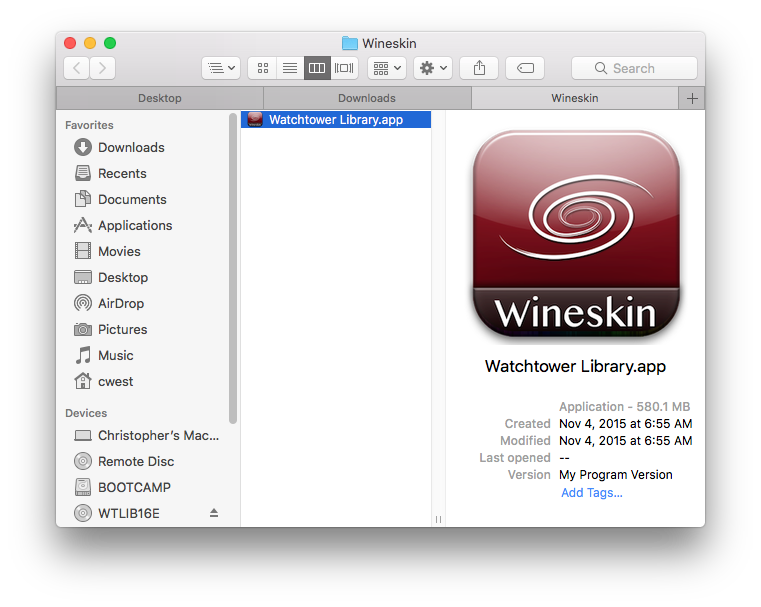 For some reason it seems the WTLib icon doesn’t show up in my Launcher, but its the Wineskin logo with WT Library below it. Doesn’t matter cuz it still works!! Thank you so much for the guide. I was trying to install the Mandarin Watchtower Library but it turned out that all the characters are not recognized. They appear as squares. Can you help me with this please? Thanks for the excellent instructions. It works well. Does anyone know how can I get the Library/Print menu item to work? Currently it is dimmed and cannot be invoked. This is extremely comprehensive and well made. Thanks so much for this. I am so excited to have Watchtower Library on my Mac. Thank you for your instruction. 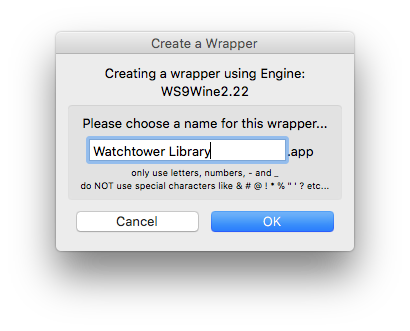 I was trying to install the Simplified Chinese version of the Watchtower Library. But the characters turned out to be like failed (all little squares no readable characters). How do I fix this? I’m sorry but I dont have that much experience with Windows to know how to solve that via Wine. Thank you very much. I´ve just installed it in English and Spanish. Both work perfectly. But, could someone help me with a problem? I can´t synchronize between both languages, but only English with English and Spanish with Spanish. Thanks for the information! Does it open slowly for everyone or is my 2013 MacBook Pro just getting too old? It does work but after it opens I have to rearrange the left navigation menu and minimize and maximize a few times to get it to appear correctly.